Piggy Bank is a Noah’s Ark for heritage breed pigs with one goal: to make our foodways safer (and more delicious)." For small and family farms, genetics are costly and business knowledge scarce. Build a genetic sanctuary for heritage breed pigs, while creating a business plan database for family farmers - a free network for open access agriculture (OAA). Help us make food safer for our future and our youth. Contributions will be used to develop the farm and gift pigs to small and family farms and culinary schools. In December 2014, we created a 5-year plan and strategic foundation for Piggy Bank. It is our belief that an open process will result in a more effective and fruitful strategy. As the project unfolds, we believe farmers from around the world will help enable and enrich the heritage breed farming movement - indeed, we regularly get emails from those in the agricultural community from as close as Florida and Texas, as far as Italy and New Zealand. Using the knowledge and experience of this community, we will crowdsource different ideas to create initiatives within the Piggy Bank business model. We will turn challenges into opportunities. We will conduct interviews with hundreds of experts and advisors, and we will use the ideas we glean for new applications and areas of need. We will carry out a survey of farmers and conduct face-to-face discussions in cities around the world. From business plans and supplier contacts, to info banks on heritage breeds and chefs who seek to buy them, we will create a network of agri-business solutions and best practices. The project will be published online and made available as Open Access Agriculture (OAA). 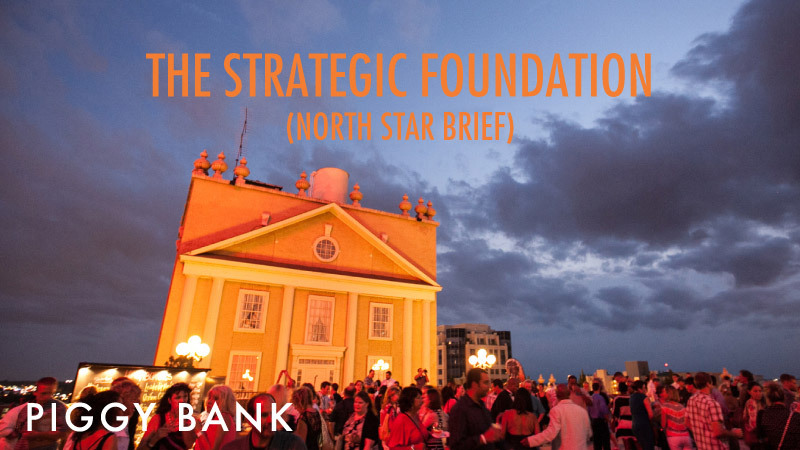 This large-format document download outlines the objectives of Piggy Bank – we call it our North Star Brief, as it aims to lead the way. This is our road map, created to guarantee transparency, honesty, and trust throughout the gestation of our project. A set of very important questions are proposed, considered, and answered at the beginning of the journey. North Star names important milestones - such as what we believe - and lays out key metrics that will help assess our progress and keep our communities aligned. This document download details our methods and toolkit. We have distilled everything down to a 20-minute presentation. Please call us if you want a personal walk-through of how we might work together to usher in the Piggy Bank Movement. Piggy Bank will create an unparalleled value proposition for our community of donors and benefactors. Piggy Bank will avoid the over-dependency on any single or dominant revenue source. Piggy Bank will support the singularity of local farms in a now-global era of agricultural ideas. Piggy Bank will maintain a culturally diverse staff with the goal of creating a genetic sanctuary and promoting open access to information for all. Piggy Bank will protect heritage breed pigs, support family farming, and build educational resources and business value for all within the community. Piggy Bank is an open access model for the good food movement that is positioned globally and practiced hyper-locally. It will play an energizing role in the communities surrounding the family farming system. It will help clear a path for sustainable agriculture and enable the next level of responsible farming to grow. The key to such growth - and strength - is participation and this is where you can help as an individual or organization. We can both better and change the world one pig at a time with your help! An organization practicing transparency with all budgets and strategies. Long-term goals to help establish parallel sanctuaries such as Chicken Bank.